Sat., Sept. 10, 2016, 9:03 p.m. Sorry, little one, this news is going to pinch for a couple of seconds: This year’s flu vaccine will probably have to come in the form of a shot, not those two little puffs up the nose. Because when it comes to preventing the misery of the flu, that nasal spray vaccine has proved to be a bit of a flop. No, the adults don’t really know why. But when they went back over the last three flu seasons and did the math, they found that kids between 2 and 17 who got the vaccine made with live attenuated virus – the puff up the nose – were 2 1/2 times more likely than children who got the shot (which uses an inactivated virus to teach the immune system) to get sick with the flu. 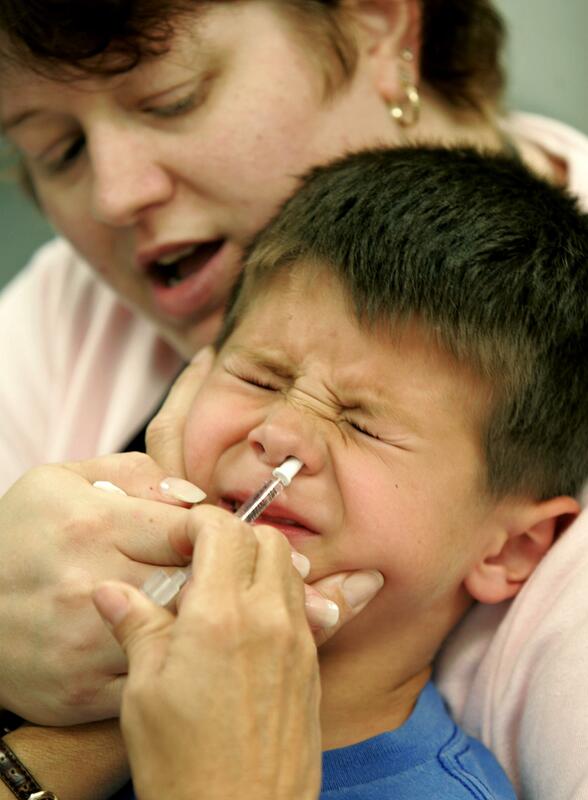 About a third of kids who got vaccinated against the flu in recent years were able to avoid the prick of a needle by getting the nasal spray instead. But in the end, calculations cited Tuesday in the journal Pediatrics showed that FluMist didn’t give any protection against the flu. That’s bad because every year, some children get very sick from influenza. Last year, the American Academy of Pediatrics said, at least 85 kids died after catching one of two strains of flu virus that circulated throughout the season. People tend to think that only children who have other illnesses – such as cancer or heart problems or asthma or diabetes – die of flu. But last year, half of the children who died of flu didn’t have any such diseases. That’s why the pediatricians’ group is saying anyone older than 6 months – no exceptions – should be getting vaccinated against flu this year. And so should the people who are around children all the time or who care for them. The pediatricians’ group recommends that pregnant women also get the shot. It’s safe at any point in a pregnancy, doctors say, and it’s important because expectant moms are more likely than others to get very sick if they get the flu. Pregnant women also pass some protection against flu along to their baby when they get vaccinated. This year, the companies that produce influenza vaccines are mixing two batches, both of which use an inactivated virus and are available in shot form. Pediatricians were told Tuesday to use whichever one is available. The viruses in the vaccine can’t make you sick. Vaccine makers have clipped out the chemical codes that allow a virus to hijack healthy cells and give you sniffles, fever and muscle aches. But they do give your body’s army of disease-fighting immune cells an idea of what a circulating flu virus looks like, so if your immune system sees the real thing (say, if that gross kid who sits behind you sneezes without putting his arm over his face), it’ll know to put up a fight. While FluMist has been ineffective, it hasn’t been a complete waste: If you’re under 8 and have gotten at least two doses of any flu vaccine (including FluMist) before, you’ll need only one shot of this year’s vaccine. That’s because “despite recent evidence for poor effectiveness,” FluMist (and any other form of vaccine since 2010) has at least introduced your immune system to the flu virus strains it’s most likely to encounter this year. Kids between 8 and 17 need only one jab with this year’s flu vaccine. But if you’re under 8 and haven’t gotten at least two doses of any flu vaccine, you’re in for two sticks this year, because your immune system might need a second look at all those strains. The Centers for Disease Control and Prevention expects that drug companies have produced enough flu vaccine to meet the typical U.S. demand, between 157 million and 168 million shot doses. Included is an inactivated influenza vaccine in FluMist form, but that’s intended for people 65 and older. Published: Sept. 10, 2016, 9:03 p.m.